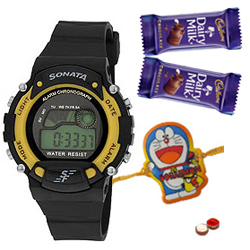 Gift your dear ones with this Sporty Sonata Watch for Smart Kids so that they feel very special. This black coloured digital sporty watch comes with resin strap and a round shaped dial made of stainless steel. This watch has water resistance capacity up to 30m. It also comes with 9 months warranty and 2 Cadbury Dairy Milk 13 gms each with Free 1 Kids Rakhi and Roli Tilak Chawal.